The other day I was visiting some of the blogs I follow, and came upon a picture I just could not resist. And a blog challenge came with it! Check back here on April 20, and see what I make of this! 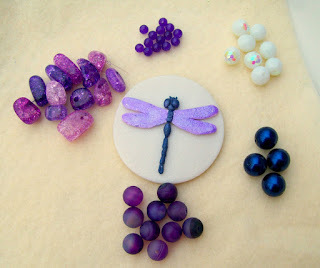 I mean a purple dragonfly and coordinating beads? The Spring Fling Kit Challenge is co sponsored by Alenka from Pepita Handmade, and Amy from AmyBeads. Alenka made the amazing dragonfly focal, and Amy is responsible for the beads. I can't wait to get started on my kit, which arrived today! That focal is simply amazing, and the beads that come with it seem to be crying to be put together. Have a blast with it!